Iris House recruited a new carer in February of 2014 to join their team. However Wendy Vermeulen who is originally from the Netherlands is a qualified Social worker and was looking for more permanent work which unfortunately Iris House could not offer her at the time. Wendy worked as a carer part time whilst looking for a full time position closer to her qualification. Wendy did find full time employment, but did she did not forget about her new found friends at Iris House. Wendy spoke with her Father Bas Vermeulen in the Netherlands who is part of the local Heusden Lions Club. Bas, was extremely touched by the community based care work done by Iris House with special needs children, he was particularly impressed that all the services were FREE to the families. Without Iris House knowing he organised a fundraiser in conjunction with his Lions Club. 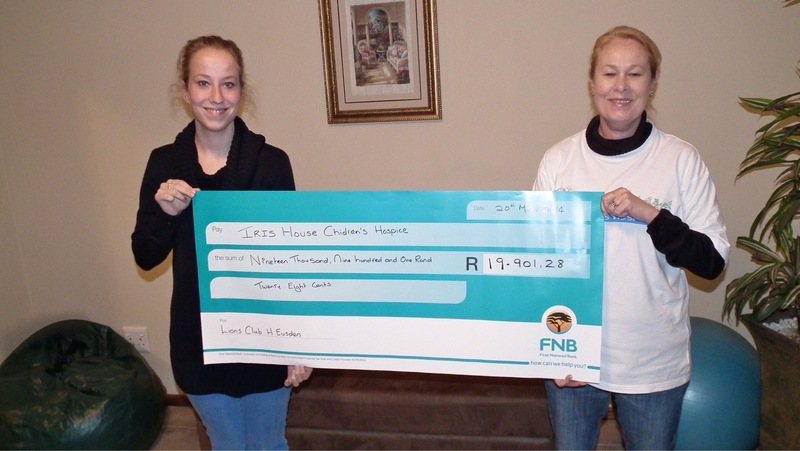 The result; a fantastic donation of R19,901.28 was received in May by Iris House Children’s hospice. But Bas was not done… he has issued a challenge ALL Lions Clubs worldwide to match or better the amount. The funds will be used to train and equip more community based carers. Currently, the demand for their respite service far out ways the size and capacity of the care team. It cost R2850 to train and equip each care team member, and the carer (unless they are a volunteer) is paid an hourly rate plus transport to do respite care sits. So as Iris House Children’s Hospice receives more demand for their services their expenses obviously grow. “We have not even scrapped the tip of the iceberg” say Sue van der Linde – Founder and Chairman of Iris House, in just three years we already have 114 families and this shows no sign of slowing down – Which gives you some idea of the demand for our services in the Western Cape. We must continue to raise funds to ensure we can offer this essential service.” We are also opening our own Hospice building where we can offer day time respite, overnight respite and end of life care. We need R5 million to make this a reality.